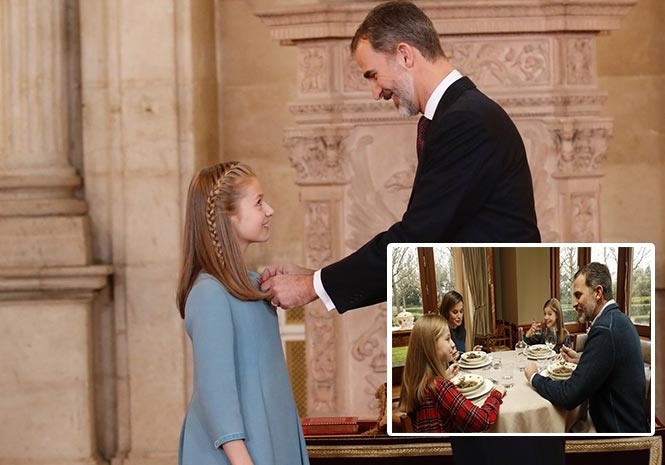 CROWNING GLORY: Princess Leonor receives the order and (inset) the Royal Family eat at home as Sofia cheekily raises her glass. KING FELIPE VI OF SPAIN has today (Tuesday) turned 50. And as the monarch reached his half-century, he presented 12-year-old daughter Crown Princess Leonor – who is first in line to the throne – with the Order of the Golden Fleece at The Royal Palace of Madrid. Among the group of dignitaries watching the ceremony was her younger sister Sofia, 10 and mother Queen Letizia, 45, who stunned in a bright red suit with a deep scarlet blouse.. The Order of the Golden Fleece dates back to 1430, when Duke of Burgundy Philip the Good founded it to commemorate his marriage to Princess Isabella of Portugal. The ceremony comes after the King and his family posted a series of candid photos and videos showing them relaxing at home to mark his birthday.